With us all returned to full(ish) fitness, we have finally managed to escape the gilded cage of Nukus. Leaving was actually a little sad, since we had began to feel quite at home there. 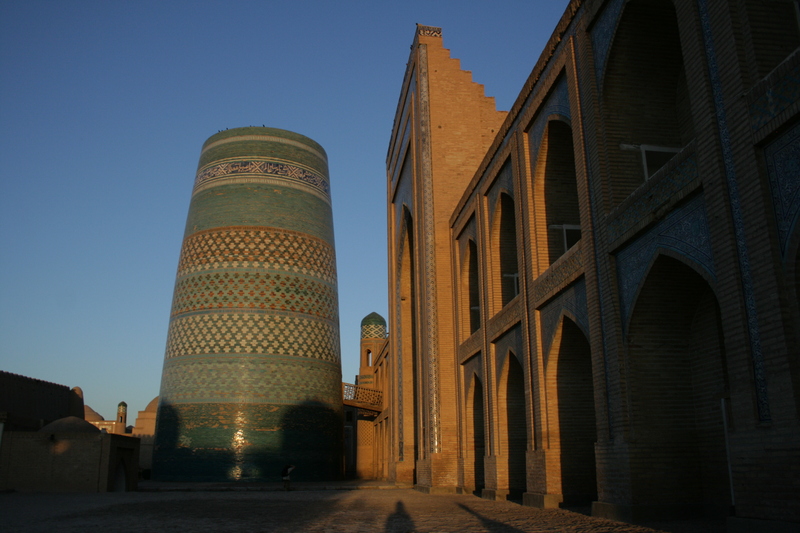 However, Uzbekistan has a number of cities with great historical importance, full of architectural wonders, and, to be frank, Nukus is not one of them. 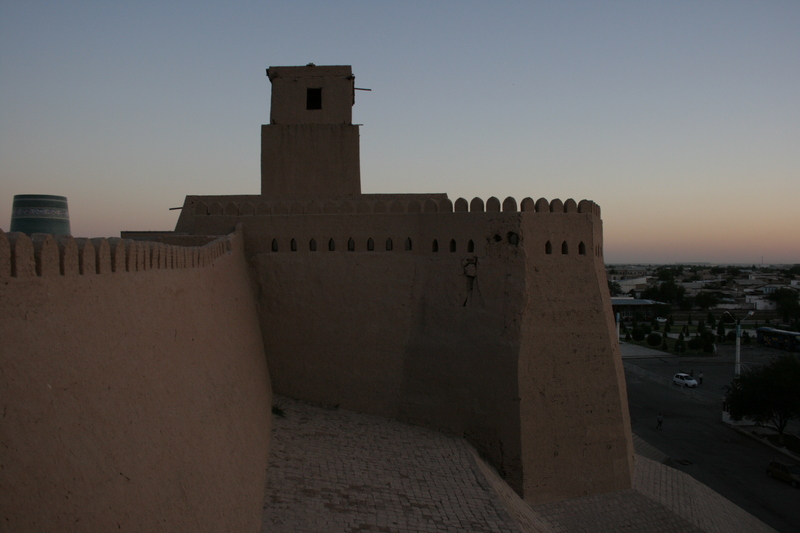 Therefore, our first port of call, was the ancient Silk Road city of Khiva. Perfectly preserved and quite heavily restored by the Soviets, it was eerily quiet, but packed full of Madrasas, Mosques and Minarets. We pretended to be normal tourists for a little while and spent a day wandering the narrow streets of the ancient city, chatting to other travellers who had found their way there. 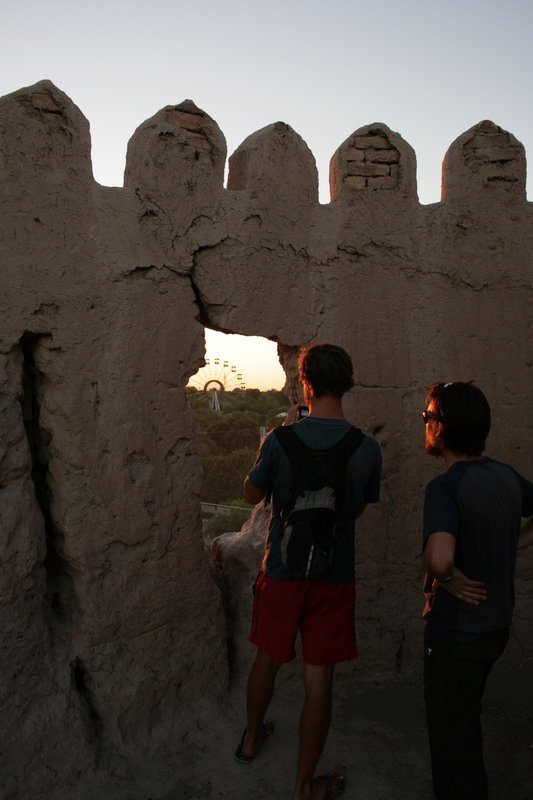 In fact, despite Khiva’s amazing sights, it remains fairly free of tourists. This may have something to do with the fact that it is very out of the way (It is almost 500km to the next Silk Road city of Bukhara), even by Uzbek standards. With Andrew’s date of departure edging closer, a form of transport slightly faster than the two-wheeled variety we are used to was needed. 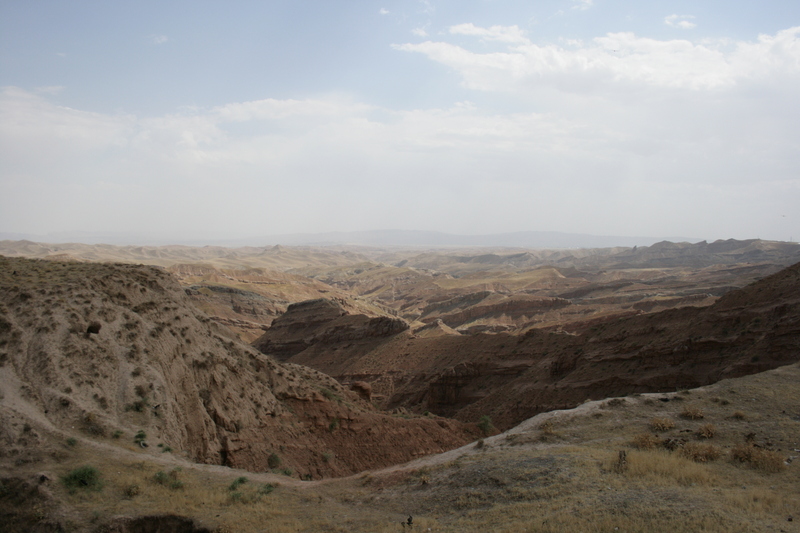 Therefore, we negotiated our way onto a rickety old bus, which was headed to Bukhara. 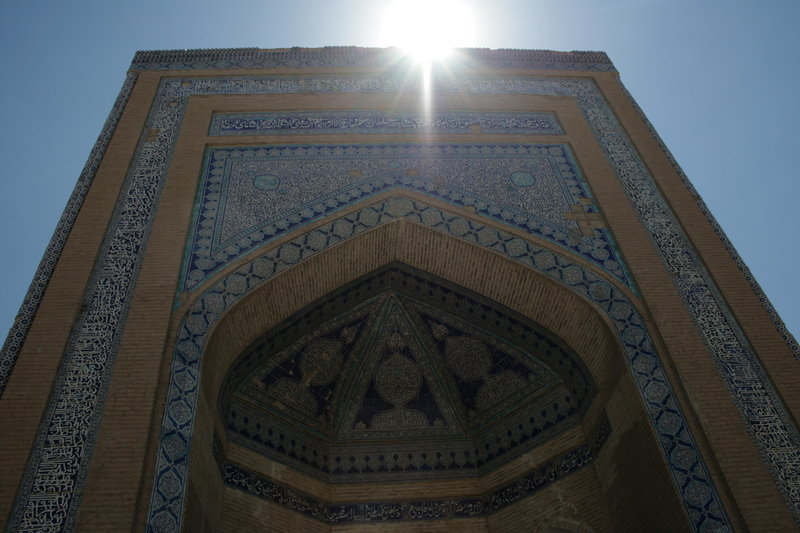 After almost an entire day of sweaty discomfort, we arrived in Bukhara – another fabled Silk Road city. 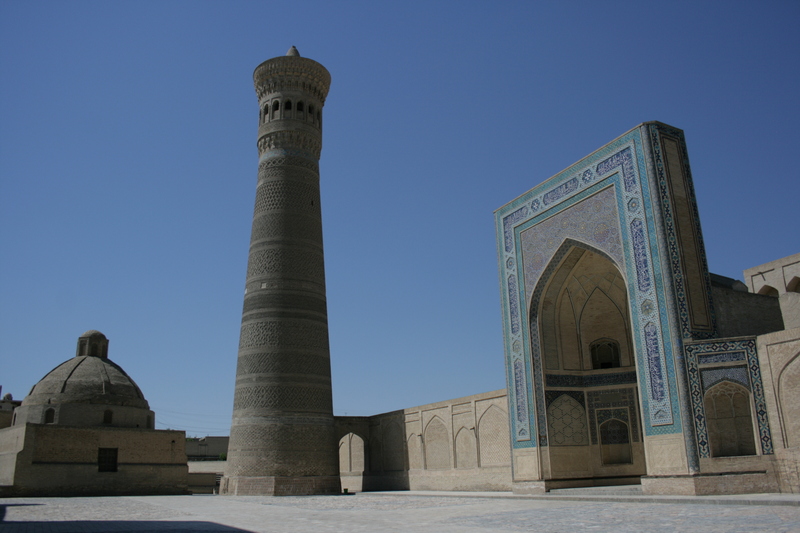 Unlike Khiva, Bukhara’s sites are scattered around the modern day city, although they are beautifully preserved in much the same way. 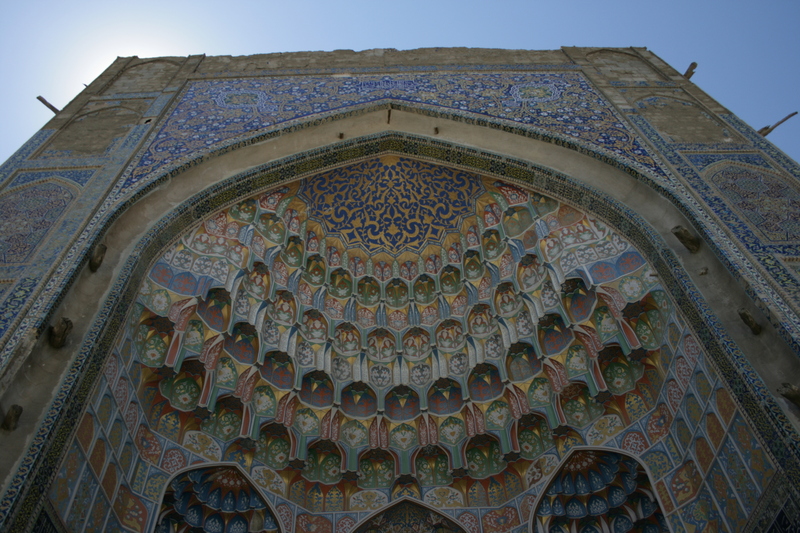 This meant that we felt Bukhara had a more lived in feel and the stunning architecture more than compensated for the slightly more touristy atmosphere. However, with the baking sun making walking hard work, we would have loved to have had more than a single day to explore the city. Unfortunately, time was not the only thing we were running short of. Our stash of dollars was also rapidly dwindling. Therefore, with the Tajik border a mighty 500 kilometres away, we decided to adopt a new tactic. Once on the road we began flagging down suitable looking trucks and asking if we could hitch lift. From this “Cyclo-Trucking” or “Hitch-Cycling” was born. For two days we cycled and hitched. We ended up squashed into the most ridiculous of positions, talking to a variety of curious drivers, and, almost always, being turfed out just before a police checkpoint. Our best (and most uncomfortable) ride was undoubtedly when we squeezed ourselves into the back of a transit van, bikes and all. Somehow, Josh ended up on a bed of cardboard, Andrew pinned against a door, and Rob on a set of fruit scales. However, this sounds positively healthy compared with our most entertaining driver, who after an hour of driving, informed us he hadn’t slept in three days and needed to chew tobacco to stay awake. But don’t worry. He didn’t smoke. That was bad for you, he told us. Now, we are in Tajikistan. We have escaped the flat lands of Uzbekistan and are already enjoying the change of scenery. The mighty Pamirs await us and the Shangri-La of cycling, The Pamir Highway, is tantalisingly close. Already, the Tajik people have made a great impression upon us. Just this morning, a man gave Josh some food and insisted that Andrew took money from him. The only reason he gave? That we are guests in his country. 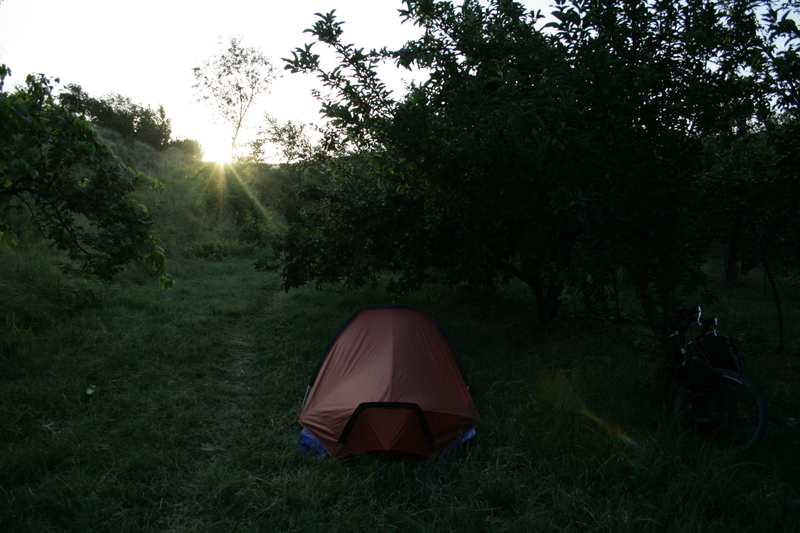 Camped on grass for the first time since Georgia. Keep it up guys, I’m loving the Tourient Express, & it’s going Crayke viral, everyone I tell is latching onto ti & raving about it!!!!!!!!!!! excellent stuff lads, looks like the scenery & surroundings are getting better and better. I imagine it will be no hardship if Andrew misses his flight!